My Singing Teacher Says To “Support Your Voice” And “Sing From Your Diaphragm.” What Does It Mean To Use Breath Control? What Does The Diaphragm Look Like? To understand the relationship between singing and breathing, it is first important to see what the diaphragm looks like and learn how it functions. The diaphragm is a large muscle sheath (pictured below and in video, right) that stretches across the bottom of the rib-cage, nearly cutting the body in half, separating the lower organs from the heart and lungs. During normal breathing, the diaphragm naturally flexes (or flattens) and contracts drawing air in and out of the lungs. 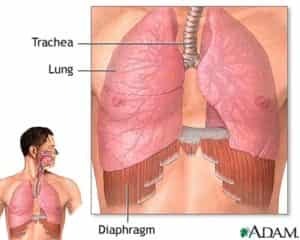 “Supporting the voice” and “singing from the diaphragm” means flattening the diaphragm more deeply than during normal breathing and maintaining the diaphragm in that flattened position to control the release of air and the air pressure that streams across the vocal cords for phonation. 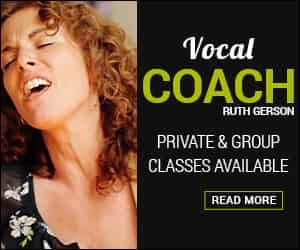 To sing better, a vocalist must learn to preserve a reservoir of air in the lungs that supports and holds up a small amount of air released across the vocal cords. A flattened diaphragm keeps a supply of air in the lungs which is used to “support” the air released with proper placement in the mouth for effortless singing. It holds the air in the body and gives the singer control of a resistant, steady breath. The air maintained in the lungs is the force and power underneath the breath released for sound. If you think of a balloon filled with air, and the sound you can make by squeezing the lip at the top, it is only a small amount of air being released that makes a sound. It is the large amount of air maintained underneath it that gives the small amount of air its force to make sound. A large amount of air supporting a small amount of air – that is the definition of breath support. Once the balloon loses too much air, the sound dwindles, the pitch falls, and wavers until, even with some air left in the balloon, there is no sound, because there is no air pressure supplying a force to vibrate the lip of the balloon. The diaphragm should be kept in a comfortably flattened position. There should be no tightening or tension. The singer is relaxed, holding the air in the body, not pushing air out or bearing down. The singer should feel as if the lower ribs are gently widening. During higher notes, and belting, the singer will feel the pressure of the air down into the abdomen. The Singingbelt gives immediate bio-feedback on the level of support the diaphragm is providing the voice. One directly feels if the intercostal muscles, as well as the obliques and lats are holding and keeping the diaphragm in position or if they have released. 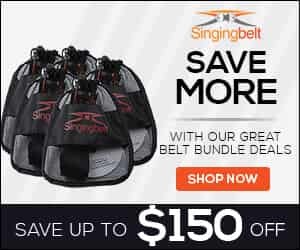 At the same time, the Singingbelt is designed not to constrict any of the abdominal muscles which aid in a steady, resistant breath needed for effortless singing.